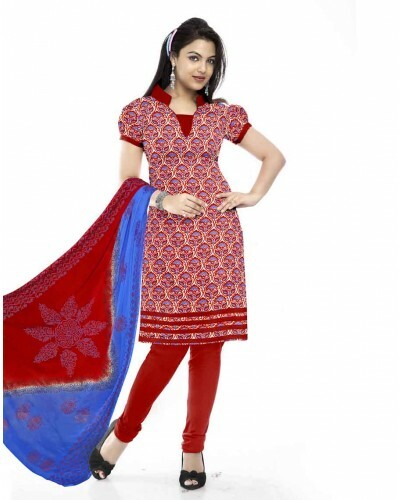 Attractive and charming print add to its ethnic appeal. It spruce up your look. Cotton ensures superb comfort throughout the day. Size of the product: Can be stitched till 42 size. Look graceful and sophisticated every time in every occasion with our gorgeous collection of salwar kameez. Featuring unstitched dress material sets in a wide range of colours, patterns and eye-catching design. This set will surely make you stand out from the crowd. When tailored in regular fit this suit will surely add more charm to your femininity and will fetch lot of compliments from onlookers. The top of the suit comprise of cotton satin, while the salwar is of pure cotton and with matching chiffon duppata which will keep you comfortable all day long.